This book was prompted, in part, by the many misconceptions about freestyle technique, some of which have become “conventional wisdom.” For example, ineffective arm synchronization (like catch-up stroke), counterproductive drills (like one arm freestyle), and nonscientific analysis procedures (like adopting a technique element of a champion only because he/she swims fast) have contributed to the proliferation of misconceptions. In contrast, all the technique elements presented in this book are based on principles of physics and decades of research, including thousands of trials using synchronized video and force-measurement technology. Developed with the individual swimmer in mind, this book is based on more than 30 years of research and supported by specific experience in coaching (from age group to college level), consulting with domestic and international swim teams, and the author’s work with individual swimmers at every performance level (from beginners to world record holders). Although every technique element in this book has a scientific basis, every effort has been made to make each point understandable and easy for a swimmer to apply. 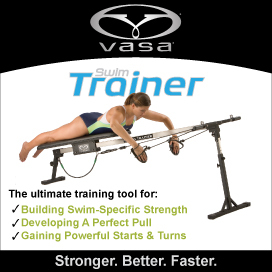 As with anything worth doing, however, improving swimming technique is not for the un-motivated. Swimming is a complex skill, requiring many thousands of repetitions to change. Keep in mind that improving your technique is the ONLY way to reach your full swimming potential and avoid the repetitive motion injuries so common in swimmers. Unfortunately, early success in competition usually results in an increase in training distance at the expense of continuing technique adjustment. (Swimming may be the only sport in which training quality (a focus on performing with an effective technique) is often sacrificed for quantity (training distance)! The greater the training distance, the more important it is to emphasize technique – both to avoid injury and reinforce positive technique elements. At Swimming Technology Research, the science behind every idea is paramount. At the same time, not every swimmer shares that fascination with the underlying biomechanical, physiological, and anatomical foundations. For this reason, effective technique is presented first in this book – much of the scientific basis is saved for the chapter on advanced concepts at the end. For those of you interested in the science behind the ideas, the appendix includes summaries of research, as well as links to additional resources and reference material. STR research is ongoing and your insights/comments about applying the concepts and strategies are always welcome. Contact Dr. Havriluk at havriluk@swimmingtechnology.com. Approaching Perfect Freestyle is available at the STR store.